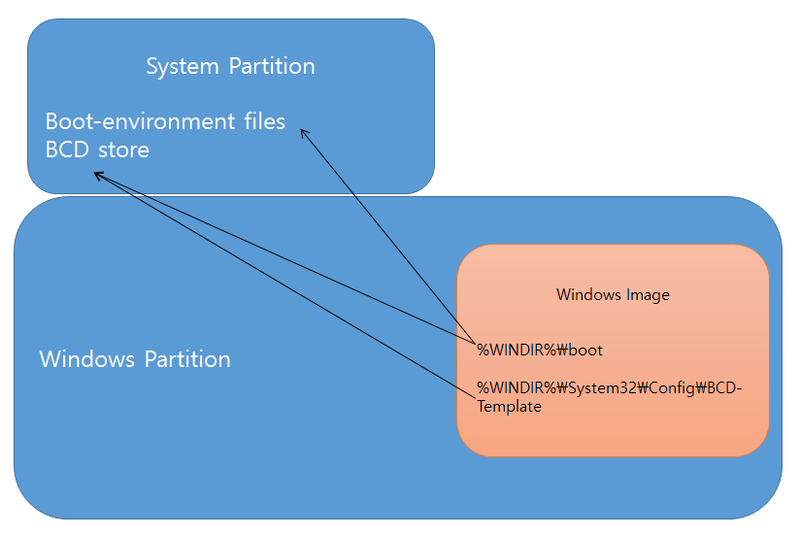 BCDboot 이 "boot-environment 파일"들을 설치된 Windows 이미지에서 "시스템 파티션"으로 복사한다. BCDBoot 은 시스템 파티션에 "BCD(Boot Configuration Data) store"를 만드는데, 이 BCD store 는 컴퓨터가 Windows partition 으로 가서 부팅하도록 해준다. UEFI 기반 컴퓨터에서는 BCDBoot 은 이 boot 파일들을 가리키기 위해 NVRAM 에 firmware entry 를 추가한다. BCDboot 은 새로운 BCD store 를 만들고, 시스템 파티션에 있는 BCD boot-environment 파일들을 초기화하기 위해서 %WINDIR%\System32\Config\BCD-Template 에 있는 template 파일을 이용한다. BCDboot 은 최신버전의 boot-environment files 를 os image 의 %WINDIR%\boot 폴더 에서 시스템 파티션으로 복사해 준다. 기본적으로 BCDboot 은 현재 Windows partition 에 대한 boot entry 가 있다면 현재 있는 entry 를 지우고 다시 복사한다.